When you're from Texas, people who you meet ask you questions like, "Do you have any cows?" It's nice to be able to say yes. They ask you, "Do you have horses?" Bet you got a bunch of guns, eh? They all want to know if you've been to Southfork. They watched Dallas. Have you ever looked at a map of the world? Why sure you have. Look at Texas with me just for a second. That picture, with the Panhandle and the Gulf Coast, and the Red River and the Rio Grande is as much a part of you as anything ever will be. As soon as anyone anywhere in the world looks at it, they know what it is. It's Texas. Pick any kid off the street in Japan and draw him a picture of Texas in the dirt, and he'll know what it is. What happens if I show you a picture of any other state? You'll get it maybe after a second, but who else would? Even if you do, does it ever stir any feelings in you? In every man, woman and child on this little rock the Good Lord put us on, there is somewhere in them a person who wishes just once he could be a real live Texan and get up on a horse or ride in a pickup. Did you ever hear anyone in a restaurant go, "Wow... so you're from Ok-la-homa. Cool. Tell me about it"? There is some bit of Texas in everyone. Do you know why? Because Texas is Texas. Texas is the Alamo. Texas is 183 men standing in a church, facing thousands of Mexican soldiers, fighting for freedom, who had the chance to walk out and save themselves but stayed. We send our kids to schools named William B. Travis and Bowie, and do you know why? Because those men saw a line in the sand, and they decided to be heroes. John Wayne paid to do the movie himself. That is Texas. Texas is Sam Houston capturing Santa Ana at San Jacinto. Texas is Texas Independence Day and Juneteenth. Texas is huge forests of piney woods like the Davy Crockett National Forest. Texas is breathtaking mountains in Big Bend. Texas is shiny skyscrapers in Houston and Dallas. Texas is oak and cedar trees, cactus, Bluebonnets and Indian Paintbrush in the beautiful Texas Hill Country. Texas is world record bass from places like Lake Fork. Texas is Mexican food like nowhere in the world, even Mexico. 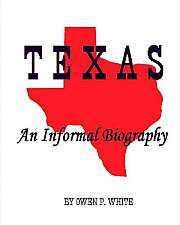 Texas is larger-than-life legends like Earl Campbell and Nolan Ryan, Denton Cooley and Michael DeBakey, Lyndon Johnson, George Bush, and George W. Bush, Willie Nelson and Buddy Holly. Texas is great companies like Dell Computer and Compaq. Texas is huge herds of cattle and miles of crops. Texas is skies blackened with doves and leases full of deer. Texas is the best Bar-b-que anywhere. Texas is a place where cities shut down for the Cowboys on Monday Night Football and the streets are deserted during church. Texas is beaches, deserts, lakes and rivers, mountains and prairies. By federal law, Texas is the only state in the U.S. that can fly its flag at the same height as the U.S. flag. Think about that for a second. You fly the Stars and Stripes at 20 feet in Maryland, or California, or Maine, and your state flag goes at 17. You fly the Stars and Stripes in front of Pine Tree High in Longview, Texas, at 20 feet, and the Lone Star flies at 20 feet. Our capitol is the only one in the country that is taller than the capitol building in D.C.
We signed those in as part of the deal when we came on. Texas was its own country. The Republic of Texas. Every time I think of all these things I tear up. All of them make you proud to be a Texan.